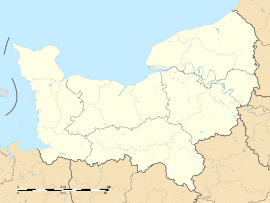 Imbleville is a commune in the Seine-Maritime department in the Normandy region in north-western France. A farming village by the banks of the Saâne river in the Pays de Caux situated some 20 miles (32 km) south of Dieppe at the junction of the D2 with the D25. The church of St.Jean-Baptiste, dating from the twelfth century. The fifteenth-century château de Bilmorel. Wikimedia Commons has media related to Imbleville. This page was last edited on 20 May 2018, at 21:23 (UTC).